If you’re a regular reader of this blog, you won’t be surprised to hear that women are underrepresented in physics and STEM in general. 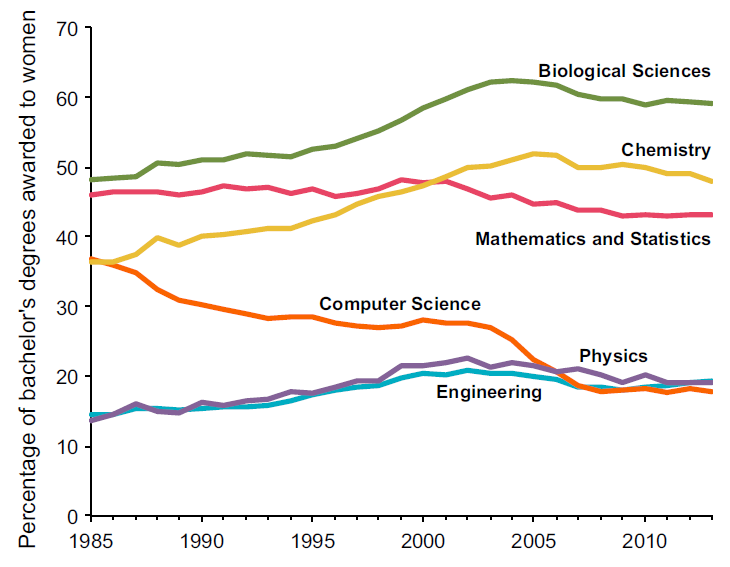 While biological sciences, chemistry, and math are at or approaching gender parity, physics, engineering, and computer science continue to overwhelmingly award degrees to males (~80%). Various reasons for this have been proposed such as men are better than women at math and science or that men have greater interest in math and science than women. However, these explanations don’t explain the gender gap as whether men outperform women on math exams depends on which country the data is collected in and women tend to earn higher grades in both math and science than men do. An alternative hypothesis known as the “variability hypothesis” states that although men and women may perform about equal on average, there is a greater variability in male performance which leads to a greater number of high-performing men in math and science than high-performing women, and hence, more men in math and science. The goal of today’s paper is to investigate whether this hypothesis can explain why women are underrepresented in many of the sciences. To collect data for this study, the researchers performed a meta-analysis of 227 prior studies that reported effect sizes on grades, which means the studies reported how many standard deviations the average grades of men were above or below those of women. The researchers looked at grades instead of test scores because grades are more likely to influence a student’s self concept, (how an individual views themselves), than test scores are, meaning grades are more likely to impact career choices. These studies included data from nearly 1.6 million students. Of the studies, 52% were studies of overall grades, 26% were studies of STEM courses, 19% were of non-STEM courses (such as language, humanities, and social science), and the remaining 3% of studies were of miscellaneous subjects. The data were further divided into what the researchers called school students (any student not in college/university) and university students, where 62% of the data came from school students. Based on previous work, the researchers expected that if the “variability hypothesis” were true, women should have higher average grades in both STEM and non-STEM fields but men should have a higher variance in STEM fields than women have (figure 2). Figure 2: Expected distribution of results if the “variability hypothesis” is correct. Notice in figure c the wider distribution of male’s STEM grades. Fig 2 in paper. So what did the researchers find? First, that across both STEM and non-STEM fields, women do earn grades that are 6.3% higher than men earn but are 10.8% less variable than those of men. Further, the grade difference between women and men is 2.7% larger at the school level than at the university level. Interestingly, the researchers found that the trend seemed constant over their 8 decades of data even though the variability in both men and women slightly decreased over that time scale. To avoid selection effects, the researchers continued their analysis by only looking at school grades. When breaking the results into STEM and non-STEM fields, the researchers found that women had a 7.8% higher grade than men have in non-STEM fields but only a 3.1% higher grade than men have in STEM fields. However, women’s STEM grades were 7.6% less variable than men’s STEM grades and women’s non-STEM grades were 13.3% less variable than those of men, confirming that men do have higher variability in their grades. However, the researchers found that men don’t begin to outperform women in STEM until looking at the top 10% of grade earners. 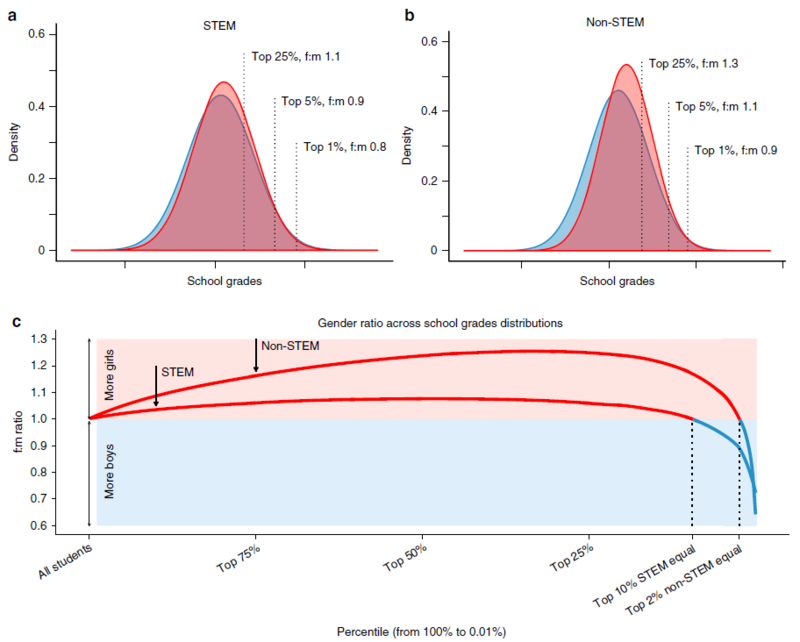 Figure 3: A: grade distributions for men (blue) and women (red) in STEM. f:m stands ratio of women to men at the given percentile. C: Gender ratio as a function of percentile. When the curve is red, there are more women than men at that percentile and vice versa for blue. At the top 10% of STEM grades, there are roughly equal men and women. Figure 3 in paper. As grades affect future educational obtainment and students’ self-concept, roughly equal grades between men and women and more men in only the 10% of grade earners in STEM courses would seem to imply that men and women should participate in equal numbers in STEM. However, this is not the case. To try to explain why women are underrepresented in STEM, the researchers offered three explanations. First, women may choose non-STEM fields because they have fewer competitors in these fields as men tend to perform worse than women in non-STEM fields. Second, women may face backlash effects when choosing a STEM career: women who conform to gender stereotypes may be perceived as less competent in STEM while if they were to defy those stereotypes, they may have halted career progress and face backlash from both men and women. Finally, prior work has shown that students who are high-achieving in both STEM and non-STEM subjects prefer non-STEM careers. As women are more likely to be high-achieving in both subjects that men are, the previous statement implies women would be more likely to choose non-STEM careers. So what can we take away from this paper? The key takeaway is there is greater variability in the grades of men than of women. However, the variability is not enough to explain why men are overrepresented in STEM fields. The researchers suggest that it is alternative factors such as stereotypes and backlash effects that instead contribute to the low representation of women in STEM. The researchers suggest that future work to increase women’s participation in STEM should work to make STEM more attractive to women by addressing both internal and external beliefs about women’s career options. For more information about why women are underrepresented in STEM, Dr. Rugheimer of Harvard University has created a repository of peer-reviewed articles discussing the challenges women face in STEM. Her page can be found here.